Here at Klassic Keyless, we offer a complete, do-it-yourself keyless entry kit designed to fit your vehicle. This is not a “Universal” collection of parts. We provide a comprehensive, vehicle specific system that is engineered with the shade tree mechanic in mind. Our kit comes with everything needed to install power door locks and remote activated keyless entry into your car using common hand tools that most automotive enthusiasts already have. Keyless entry module with onboard relays for a clean installation, 2 two button remote controls, 2 door lock actuators with 15 lbs. of pull and built in overload protection, 2 actuator mounting brackets, 2 rubber doorjamb boots, 2 actuator connecting rods and clips, wire harness, full color step by step instruction manual, and all necessary hardware. Klassic Keyless has just made a good thing even better. We have just completed our new power trunk option to go with our popular keyless entry systems. Now, not only can you lock and unlock your doors with our slim line three button remote control, but you can also open your trunk without having to use your key. Simply press one button to lock, the other button to unlock, then hold down the trunk button to open the trunk. Here is one that you have been waiting for. 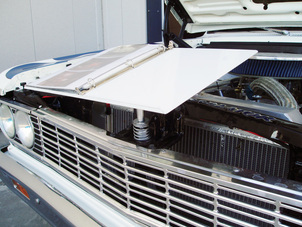 We have just completed development and are ready to ship our new system that fits 1962 - 67 Chevy II and Nova. This is available in both 2 button and 3 button systems. Same great system, brand new application. Hey Tri-5 fans, now Klassic Keyless has one for you. We have just completed our Keyless Entry installation kit for 1955-57 Chevy full size cars.. This is another of our comprehensive kits that allows you to install power locks and remote keyless entry into your 1955-57 Chevy. Just like our other kits, it includes all the parts needed and full color installation instructions to install this in just a few hours. These are in stock and ready to ship. Now available is our stand alone factory style power trunk release system. 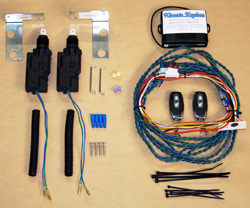 This is a complete kit that allows you to install a remote electric push button release for your trunk lid. 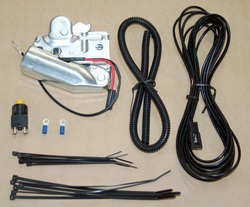 Simply replace your factory trunk latch with our power latch, mount the switch, run and hook up the wires. 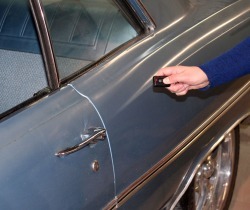 Some cars will require minor trimming of the latch opening in order to mount the latch. Klassic Keyless is pleased to announce the new SHOW-IT build book stand. This new product is designed to take your precious build photos and keep them attached safely to your car when displayed at your local car show. Simply clip your three ring binder pages (not included) containing build photos, window sticker, and other documentation into the riveted binder clip. After arriving at the show, pop your hood, press the spring loaded shaft into your hood latch, place the binder stand onto the shaft and secure with the included hitch pin. Now your photo pages will proudly stand 6” above the radiator without reducing the view of the engine or being knocked to the ground. When you are ready to leave, remove the hitch pin, lift off the binder stand and set aside, and hold the spring shaft firmly while you pull the hood latch to release the shaft. The SHOW-IT stand is available in both portrait and landscape, white and black finishes and can also be painted to match your vehicle. With its compact design, it can be easily stored in the trunk or back seat. When not being used at the shows, the stand can be used without the spring shaft to display your documentation on any table at home or work. Get one today and keep those irreplaceable photos and documents safe. 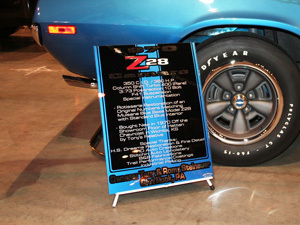 High Impact Custom Designs can create a one of a kind custom show board just for your show car. Simply send us a picture of your vehicle and a list of the information that you would like on the board, and we will create a show board made just for you. Once your information is received, we will design the sign and send you a pdf proof. After you approve the proof, we will make and ship the sign directly to you.